Our last stop was Split Rock Lighthouse State Park. It was early in the season so we were able to walk to the Lighthouse without paying a fee. The flip side was the Lighthouse was not open and there were no tours available. We walked around the Lighthouse buildings then decided to walk down to the Boat Landing. When I walked down to Canal Park to photograph the sunrise I found that it was not a normal sunrise. The sun was just an orange glow in the east. It turned out that smoke from U.S. and Canadian wildfires was hanging over the lake creating a different sunrise. When we finished watching the Lake Guardian enter the harbor we drove over to the Wisconsin Point Light House. With some effort I managed to get out to the beach but it was all I could do to stand up with the wind blowing directly into me. When the waves hit the breakwater they were almost as tall as the Lighthouse. The wave action had turned the water brown. As I was photographing a rogue wave came through and drenched me. You can see it coming in this shot. More Wisconsin Point photos can be found on my website. It was a beautiful late October day when Saltie the HHL Congo arrived in Duluth to deliver a load of transformers. According to the Duluth Shipping News it flies the flag of Antigua and Barbuda. On earlier trips to Duluth it has delivered wind turbine blades. A large crowd was on hand to welcome the Congo to Duluth. The lake was the calmest I had seen it in a long time providing beautiful reflection shots. The last week in May were in Duluth. There was still a lot of ice outside the harbor. 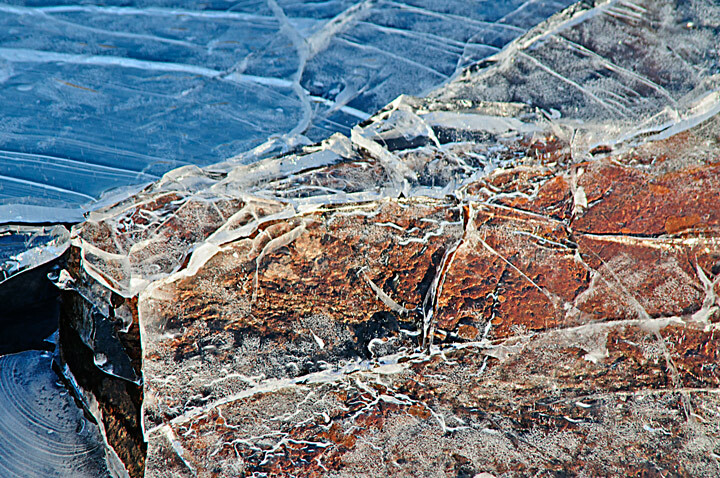 The area had been clear of ice but the winds changed and blew the ice back to Duluth. It was so thick that the tour boats couldn’t get out of the harbor. I walked down to Canal Park at sunrise to capture some photos of the ice. This shot of the Duluth skyline shows the amount of ice in the harbor. The Federal Mattawa was outside the harbor. It stayed outside the harbor for 23 days waiting to come into port. The crew couldn’t leave the ship because they hadn’t cleared customs. At first it had to wait for other ships to load grain then there wasn’t enough grain to load. The first shot was taken from the lake side of the Duluth Aerial Lift Bridge. I had to wait for cars to cross the bridge because of the vibration. For the second shot I crossed to the harbor side of the Duluth Aerial Lift Bridge so I could include some of the bridge in the photo. When I visit Grand Marais, Minnesota I always make it a point to visit Artists Point and the harbor area at sunrise. These are a few shots from my last visit. A week ago my wife and I drove up to Duluth. As we were leaving I checked the Marine Traffic site to see if any ships would be coming into Duluth during the day. As it turned out there was a large convey of ships on their way from the Soo Locks. Most of the ships were coming to Duluth although a one was going to Two Harbors. I didn’t expect to see them arrive in Duluth because we were going to make a stop at Crex Meadows to photograph birds. As we neared Duluth I checked Marine Traffic and discovered the ships had not arrived so we headed down to Canal Park to watch them come through the Ship Canal. In total there were six ships in the convoy. This is the largest number of cargo ships that I’ve seen come into the harbor at one time. This was also the last convoy of the spring. Since the shipping season opened the third week in March ships have only been able to sail from the Soo Locks to Duluth in convoys escorted by Coast Guard Ice Breakers. The ice has just been too thick for the ships to make it on their own. One of the ships in the first convoy leaving Duluth required a month to make the trip. Normally four deliveries could be made during that time. Some of the steel mills had to close because they ran out of iron ore. The Coast Guard said it would come to a freighters aid should it become stuck in the ice. As the ships were entering the harbor an ice breaker was working off of the Superior entry. You can still see the ice outside the harbor. As each ship came through the Ship Canal it pushed more ice into the harbor. It took a couple of hours for all of the ships to make it into port. 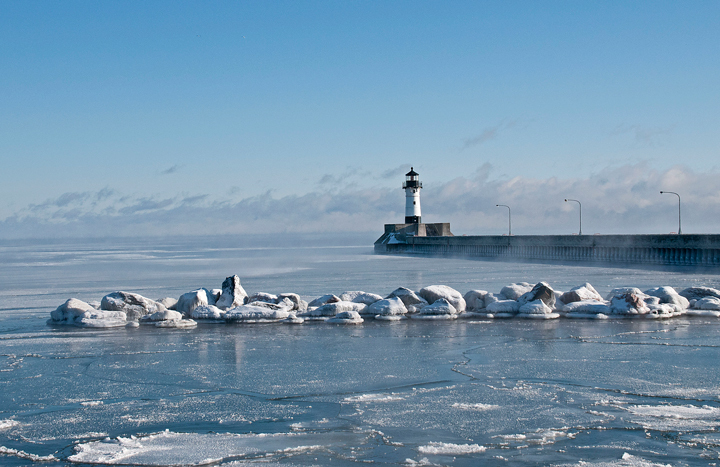 We drove up to Grand Marais Harbor last week. This is really a two day trip from Duluth if you want to stop along the way but we did it in one day. Normally we drive to Grand Marais and stay then drive up to the Canadian Border the next day before returning to Duluth. This gives us plenty of time to make stops along the way. I had hoped to get some nice intimate ice photos on the rocks outside the breakwater but there was just too much ice this time. This was a shot taken several years ago. The walkway on the breakwater was solid ice so we walked on the frozen water part of the way out before giving up. A snow squall started while we were out on the breakwater and the wind was blowing. When we left Grand Marais little did we realize that our adventure was just beginning. This is the time of year that the deer come out of the hills and gather along highway 61. A few years ago we counted several hundred between Grand Marais and Duluth. On the way up we only saw a few dead ones. Just out of Grand Marais we saw a car just ahead of us hit a deer. The driver was ok. The deer was still alive and the car was totaled. We saw where another car hit a deer a short time later. The driver was checking out the front of the car and the dead deer was a little ways behind the car. Unfortunately deer weren’t the only problem. Highway 61 has passing lanes every so far and we had pulled into the right lane. As the lane ended we pulled back into the main lane. Just then we saw a herd of deer in the road so my wife started pumping her breaks to alert the car behind us. Rather than slowing down he sped up so he sped up and drove on the right shoulder to pass us. Fortunately he missed the deer. Before we got back to Duluth we had one more exciting moment. We were going slower than normal because all of the problem along the road when a van passed us on the left and at the same time a car passed us on the right shoulder. We were very happy to make it back home. I drove down to Canal Park a few weeks ago to watch the Baie Comeau arrive in port. It was -26 with a wind chill that was even colder. There were a few brave people around to watch the ship come into the harbor. Most of the folks weren’t aware there was a ship about to arrive until I told them. Unfortunately the fog was so thick that we weren’t able to see the ship until it reached the ship canal entrance. The Baie Comeau was accompanied by a couple of Great Lakes tugs that would help it get through the ice to its dock. Most of the ship canal as well as the harbor was covered in ice so when the Baie Comeau broke up the ice even more steam rose from the harbor. 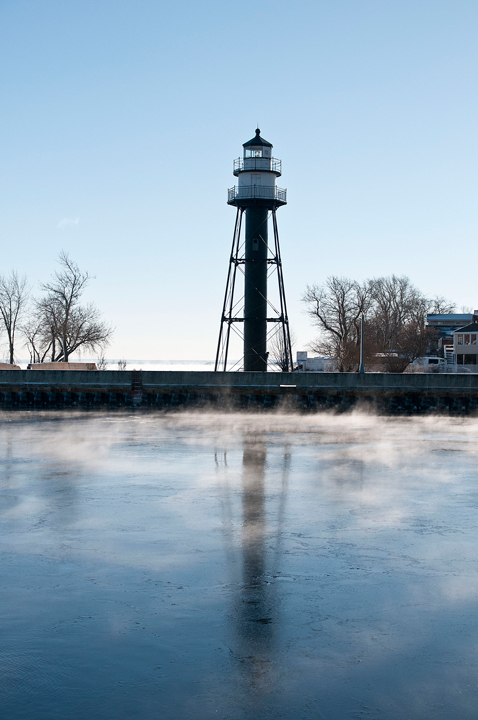 The air temperatures were -18 and the wind chill was -30 below on a beautiful morning in Duluth. 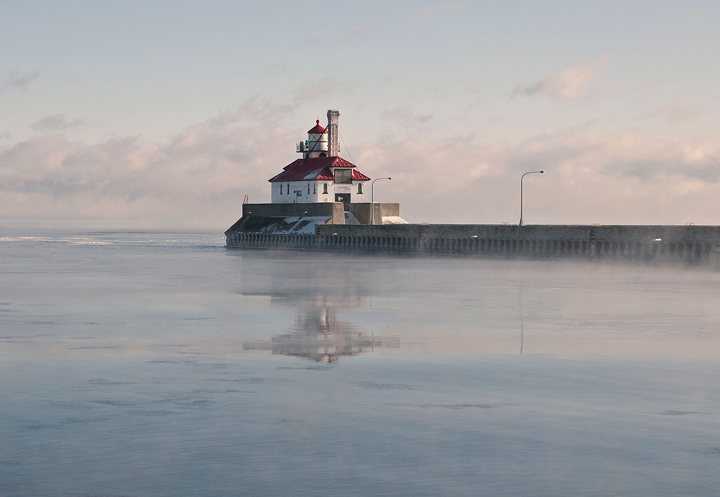 The fog was rising off of the relatively warm water and there was fog out on the lake.